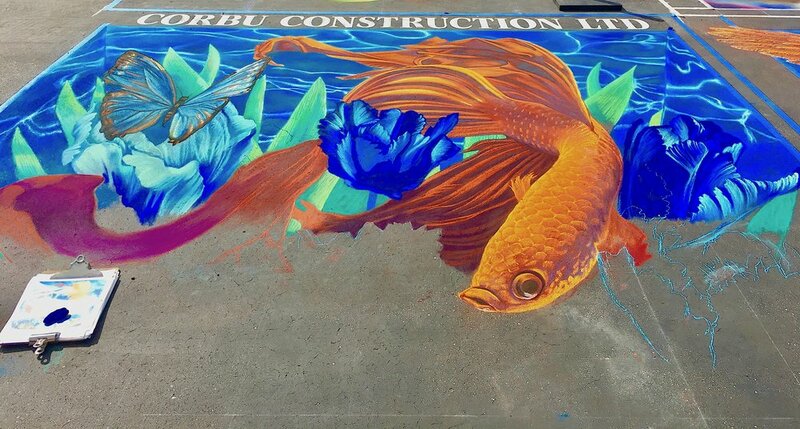 Happy Wednesday: Artistry With Cats, Crabs, Koi & Cars At The Santa Barbara Mission!! On Monday, we both wandered through the chalk art festival at the Santa Barbara Mission. We each went our separate ways and took picture after picture. Ron spotted our Yogi friend, Adam. He is also an artist. We smiled at his title,"All my Zen Masters Are Cats." We had to agree!. We often see these crabs walking the beach at low tide. They act fierce when you approach them, and raise their claws ready to attack. Although the artist has not finished his work, the beauty and the talent is evident. The Koi fish looks alive! The red race car is a universal archetype. We felt the motion and the joy of racing a car.